Wedding Pillars made of fiber with a color combination of gold and white. We are also manufacturing, supplying and exporting an exclusive range of Wooden Mandap Pillars to meet the demands of our customers. These are made up of high grade iron source. These mandap pillars are looking very Classy and Elegant. 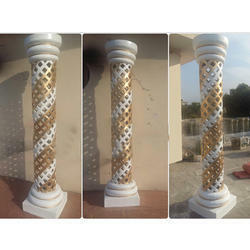 Roman Pillar on Fiber glass. Sizes are available in 9 & 10 feets. Size: 3 Feet,5 Feet,7Feet,8Feet,9 Feet,10 Feet,............. 25 Feet. Matching up with the ever increasing requirements of the customers, our company is engaged in providing Stage Decoration Pillar. export quality unbrekable crystal beans durable fiber. .
We are a reputed entity in the industry, actively engaged in offering an optimum quality range of Wedding Pillars. Amcon Fibreglass & Plastic Engineering Co. 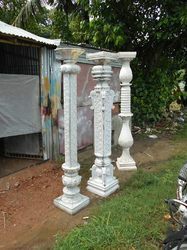 Manufactures all types of Wedding Pillars in fiberglass which can also be used on Stages, Mandaps and other wedding props. Color, Sizes can be customized according to customers preference.